After the launch of the 10-inch Surface Go last year, some brands have used its popularity as a means to slap the Go name on some of their tablets too, with the latest one being the Alldocube KNote Go, ALLDOCUBE KNote Go is a cost-effective tablet. 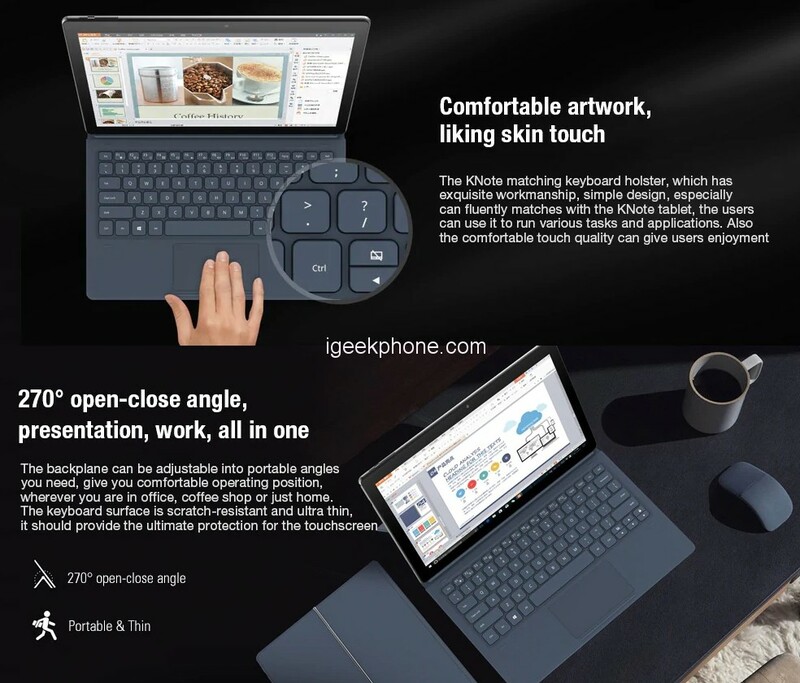 Tablet + laptop 2 in 1 design, it’s more convenient to use. Equipped with an 11.6 inch 10-point IPS touch display, brings your photos and videos to life. Windows 10 home OS ensures you more wonderful user experience. Powered by Intel Apollo Lake N3350 Quad-core processor, offers you smooth operation and stable multitasking experience. 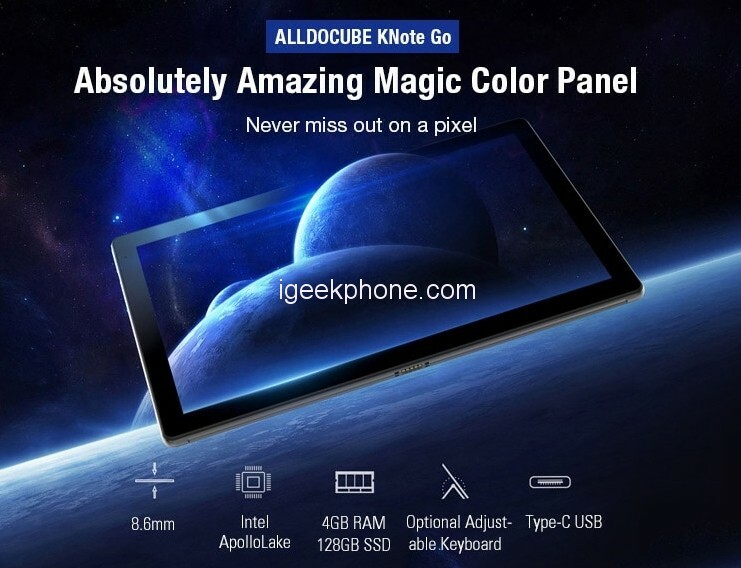 ALLDOCUBE KNote Go tablet comes with the astonishing design with an IPS touch display. The 11.6-inch screen will give you great compatibility to watch the videos and play the games along with the resolution of 1920 x 1080 (FHD). It is a unique feature that is sure to redefine your visual and touch experience. The Chinese firm has innovatively combined grass and touch panel into an all-touch display. Hence, extending you an increased respond speed without any undesired delay. The dimension of the ALLDOCUBE KNote Go is 11.38x 7.09x 0.34 which will make you comfortable in the hands. Alldocube KNote Go is an 11.6-inch Windows 2-in-1 tablet, but without a built-in kickstand, as the stand is provided by the detachable keyboard cover. ALLDOCUBE KNOTE Go features the windows 10 giving you an excellent interface like a Laptop which runs very effectively. 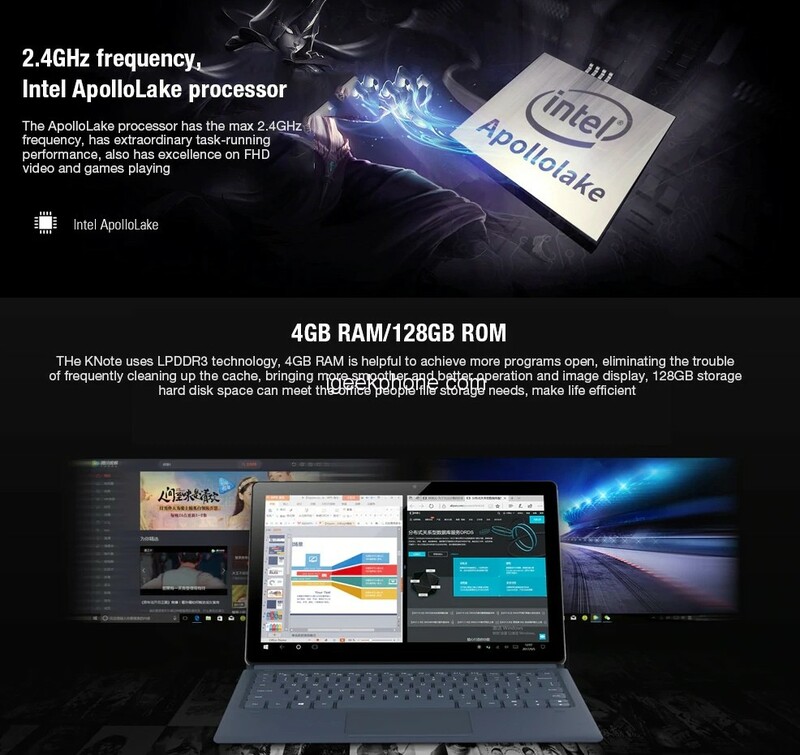 The tablet comes with the Intel Apollo Lake N3350 Quad-core 1.10 GHz to support the window 10. Along with this, you get a Graphic card of Intel UHD 500. The storage capacity is always is one feature that is looked while buying a tablet. You will get the great capacity of the storage with 4 GB of RAM and 128 GB extended memory, along with the SSD of 128 GB. Alldocube gives you a wide range of RAM to let the customers play the games without any stoppage of the processor. ALLDOCUBE KNOTE Go tablet provides you an additional feature of taking the perfect shot. The Front camera of the tablet is 2.0MP which will provide you a clear image and help you have a good video chat with friends and family. The back camera of the new ALLDOCUBE KNOTE Go is 5MP. This will give you a clearer image of nature with an autofocus feature. As always the ALLDOCUBE provides customers with a massive battery. In this new tablet to the company provides the battery of 4000mAh which is quite enough to last a long day. The other basics are there, like dual-band 802.11 a/b/g/n/ac Wi-Fi, Bluetooth 4.0, a 2MP front camera and 5MP rear camera, a USB Type C port, and a 3.5mm audio combo jack. Gearbest is now providing the new ALLDOCUBE KNOTE Go with a 25% off discount. Now you can buy this tablet for just $273.99. You just need to click on the link below to avail this offer now.